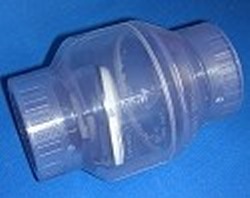 Rated 3" FPT (female NPT) (female pipe thread) clear swing check valve. NO SPRING, NO METAL. Must be orientated a certain way for it to close properly. If you need a valve you can put in any position look for the spring check valves on this page.